My wardrobe is somewhat of a talking point within my friendship group; it is quite very expansive and yet I still have days where I don't know what to wear. The other day, after reading through Elle, I was inspired to finally sort through my wardrobe and get rid of stuff that I never wore. Anyone who has met me will testify to my love of colour and prints, I can't think of anything worse than wearing black from top to toe! After sorting through all of my clothes it was clear to see what is important for me in my wardrobe. naivete and youthful exuberance, right? spirits and there's nothing more attractive than a smile right?! ♥ PRINT: I would say that at least 60% of my wardrobe is composed of prints, mainly floral but spots and stripes put in a decent showing too. My go-to-outfit is a printed dress and cosy cardigan and a tea dress can be dressed up and down with a few choice accessories. ♥ QUIRKY DETAILS: Whether this is a ruffle on the sleeves of a blouse or a heart shaped cut-out in homage to Luella, the importance is in the details... Some suspender tights can add an edge to even the most demure outfit and bows make everything better. What are the key elements of your wardrobe? Are you a fan of black or colours? My closet definitley needs a clean as well. Things are literally falling out. I know I have a lot of stripes in my wardrobe. I absolutely love them! And is that a picture of you as a child I see in the collage? So adorable. Laura- Thank you! I love those tights too much to ever give them away though! 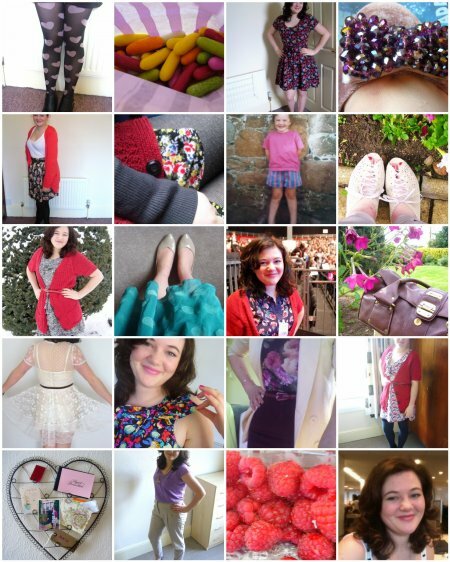 Ooh, I love your collage! It is so interesting to see all the photos together and really get a sense of the elements which make up your style! Especially the cute photo of you as a little'un! The collage is adorable, look at the little you! So cute!! I'm like you, my personal style is often a talking point, friends and colleagues will say stuff like 'I was in New Look today and it was full of Sarah dresses!' I hate throwing away clothes although every now and then I try to get more ruthless with it, generally when I can't shut my wardrobe any more!